Andrew Sullivan has a post up right now called "Looking at Race." 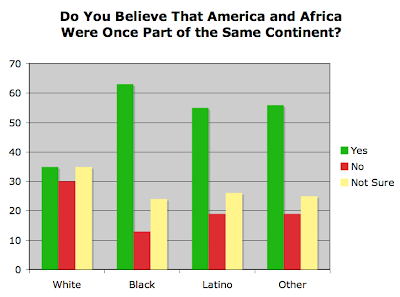 It concerns a poll that asks Americans whether they believe that Africa and America were once part of the same continent. At first, I thought, wtf does the existence of Pangaea have to do with race? Of course America and Africa were once part of the same continent, but the Atlantic Ocean has been around for about 100 million years, while our species is only a few hundred thousand years old. "Race" is not really a concept that maps well onto geologic time. Then I looked at the breakdown of the results. Yikes! Only 35% of white respondents said "yes," while 63% of black respondents agreed. I imagine that this gap is not reflective of overall scientific knowledge. Did all the white kids skip Earth Science? 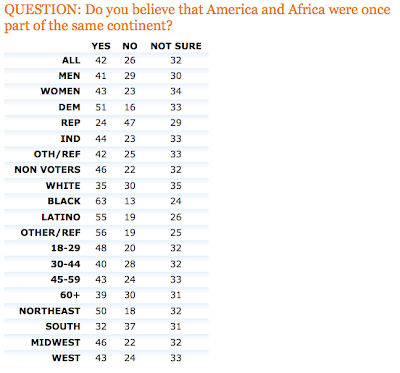 From this evidence, it seems that white people (particularly those who are Republicans, Southerners, or over 60) are less likely to accept the science of plate tectonics, perhaps indicating that they are still struggling with the idea that all people belong to the same species. If it were just Republicans or Southerners who were willfully ignorant of continental drift, I might be able to explain it away by blaming Young Earth Creationism. But that racial gap is astounding. White people do realize that our species originated in Africa, don't they? And that all humans of all races are related? Also — and I hestiate to point this out — white people are not actually from America originally. One last thing — in his post, Sullivan says that he "would have said yes, but not too confidently." Really? Because I definitely covered Pangaea with my second graders. I thought that this was common knowledge, at least among elementary school grads. Update: Some are saying that the question is flawed — that it doesn't really tell us how many Americans "believe" in continental drift. But that isn't the point, is it? The point of the question is to tell us how many Americans reflexively reject any idea that connects North America to Africa. It's a brilliant question because you can't just straight-up ask people if they are racist. Many people don't know what the term means, though they're pretty sure they aren't. You have to ask roundabout questions like this one.